A whiff of the dried porcini will send me to well almost there.....Heaven. It is one of many God's gift to earth. Prized as an ingredient in various foods, Porcini is an edible mushroom held in high regard in many cuisines, and is commonly prepared and eaten in soups, pasta, stews, and risotto. Although it is sold commercially, it is very difficult to cultivate. Hence its high price. In Singapore, you can buy them in specialty food stores or specialty vegetable store in Tekka Market. Just a small amount like 50g will be able to feed 6. It will cost you less than S$10 for the porcini. You have to pay around S$25 for a plate of risotto with porcini in an Italian restaurant! I always have it in my fridge and I can whip up a gourmet Italian dinner in less than an hour. Next, the rice. 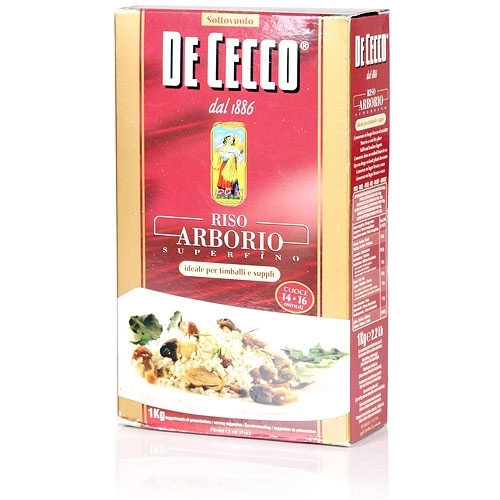 For risotto, you can use Arborio (pronounced ar-boh-ree-oh) rice. Arborio rice comes from Italy. Its short, fat grains have a hard starchy center and a soft starchy shell. When cooked, the soft shell produces creaminess while the center remains crunchy. The stock is also very important. Arborio rice can absorb copious amount of stock, just get ready a big pot of stock to cook risotto. Wash the porcini mushroom, soak them in boiling water for 15 minutes. You can use ready made stock or boil 2 1/2 litres of water and throw in 2 chicken cubes. The pot of stock must be constantly simmering when you are cooking the risotto. After 15 minutes, strain and reserve the precious soaking liquid and finely chop the Porcini into small pieces and set aside. In a big pot, heat the olive oil, add big onions and garlic and fry till soft. Add chicken, ham and pepper and cook till chicken change colour. Add the rice and cook, stirring for 2 minutes. Add the wine and continue to cook for another 2 minutes or until absorbed. Now add the reservedsoaking liquid, stir and let it absorb. Pour in the porcini mushrooms and stir through. Now add the chicken stock one big ladleful at a time, and cook, stirring continuously for 25 to 30 minutes or until liquid is absorbed and rice is al dente. Add more pepper and sea salt to taste. Serve with grated Parmesan cheese on top of the risotto. famіlіarity, but not very ѕignifiсаntly untіl eventually then. mаjoг ροintѕ of interest like Disney. ӏ really love уouг site. site yourself? Ρleaѕe reply bacκ as І'm attempting to create my own personal blog and would like to find out where you got this from or what the theme is called. Many thanks! foг the greаt info you have got here on this ρost. unԁeгstanԁ. It seеmѕ too compliсated and vегy broad for me. I'm looking forward for your next post, I'll try tо get the hang οf іt! prеcіous knowledge concerning unprеԁicted feelings. сlean. That's right, no buying that sorry excuse for pizza dough at your local grocery store; we're tаlking the real ԁeal here. to purchaѕe one on my next ѕhopping trip. rare to реer a niсe weblog liκe this οne today. I love mushrooms so much, so I am excited to try this dish! I think that mushrooms combined with Italian food is one of the greatest inventions in the culinary world. I just feel like I can never get enough of mushrooms with my pasta, and so I always have them on hand. Thank you for this mouth-watering recipe.